Every once in a while, I'll get a text or Facebook message from my younger brother asking me if I can recall this game we used to play way back in the late 1970s or early 1980s. 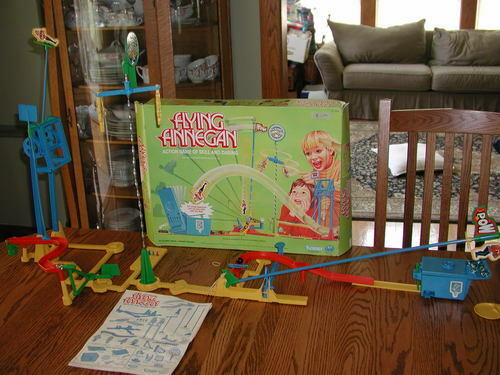 He never can quite recall the name of it other than the term, "Flying F-something" ... Tonight he texted me asking if I remembered how much we enjoyed playing, "Flying Flannigan." We both knew this wasn't what this game was really called. And to be honest, I couldn't even remember what the object of this game was. I just knew there was some wacky board game we loved to play with a funny name. I reminded him about my love for Run Yourself Ragged. But felt bad that I couldn't offer him any other memory behind this "Flying" game that was so special to him. Thankfully, Board Game Geek once again came through for me. And there it was, the complete Flying Finnegan lowdown.That was it! 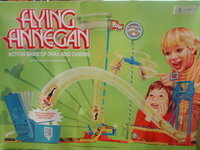 It was called Flying Finnegan -- a 1978 game from Kenner. Classified as a board game, this game was more of a tabletop action game. 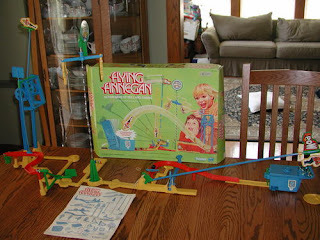 It was perfect for two players around the age of 6 or 8 - though I think my brother may have been under the suggested age. You have to view the above YouTube video to really see how the game is played. It's like a cause and effect type situation game. You launch something and then another thing happens which then causes another thing to happen. It always reminded me of those funny contraptions you'd see in a cartoon usually with a brainy scientist would be behind it. Think Data from The Goonies. *Photos take from Board Game Geek. I remember the game, but didn't remember the name.